A sweet and refreshing salad makes the perfect addition to any lunch or dinner! Holy Cannoli Batman…it’s so hot outside! I know it gets this hot every year but this is the first year I’ve been pregnant during the summer and man does this extra baby weight sure make it feel like it’s 200° out. When it’s this hot all I really want to do is sip on a nice, cool drink (like a slush) but my body needs a little more nutrition than that. 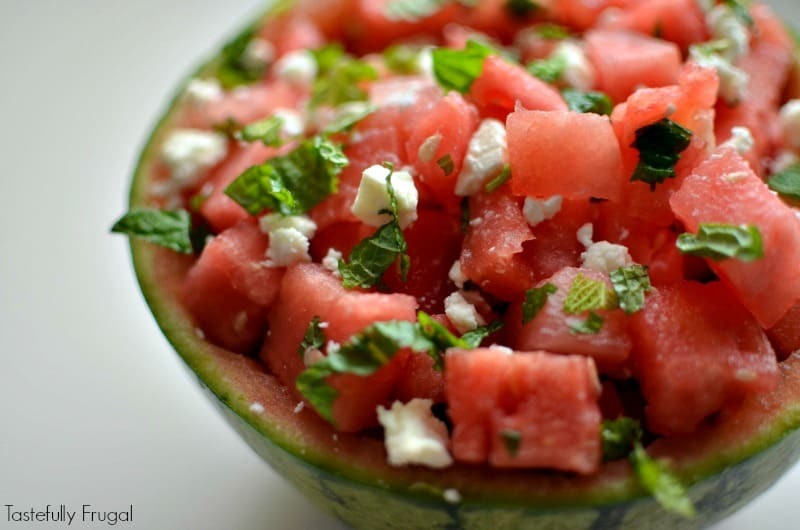 In comes this tasty watermelon salad. Last summer my sweet friend Becky brought over a version of this salad after I had a miscarriage and it was the perfect pick me up food. 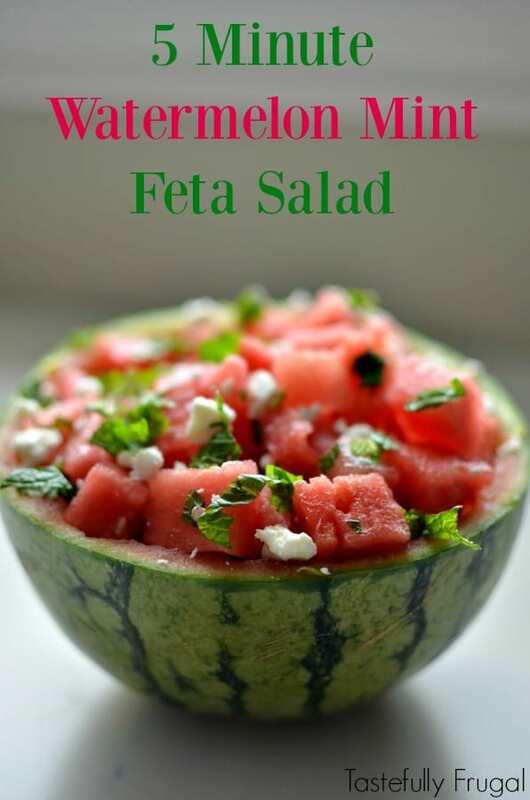 A mix of sweet watermelon mixed with cool mint and salty feta cheese. 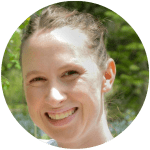 This year it is the ultimate pregnancy craving for me because it covers all the flavors I’m craving. Plus it’s a whole lot healthier than eating a big soft pretzel AND cupcakes! It’s also super easy to make and a great recipe to let the kids throw together. My boys loved being able to mix everything together. They loved it even more when I let them pour it back into the watermelon. 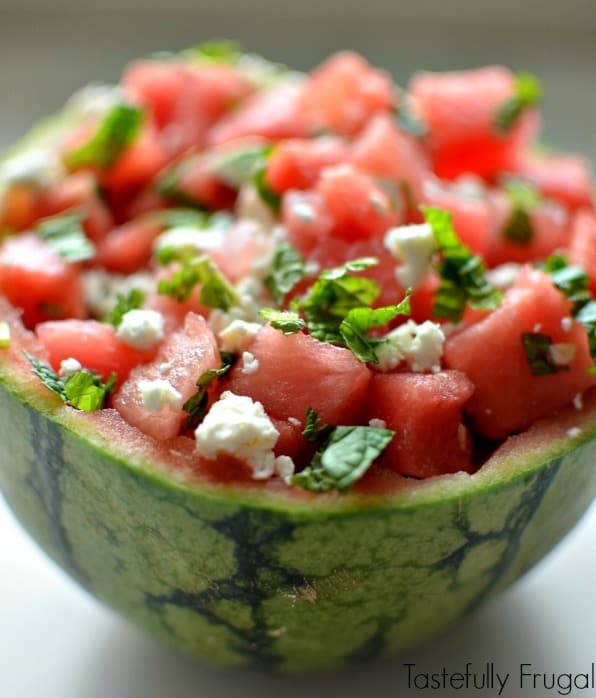 You don’t have to serve it in the watermelon but it does make for a festive serving bowl AND it makes one less dish for you to clean up after. 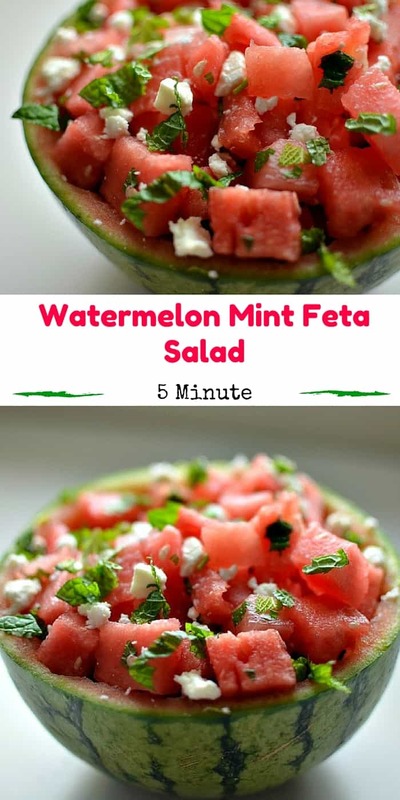 This is also makes the perfect addition to any BBQ or potluck; especially if you’re running short on time. 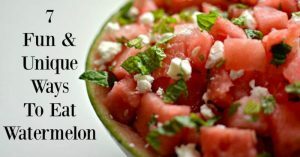 You can throw everything together in just 5 minutes (and that includes cutting up the watermelon). What are some of your favorite foods of summer?